Toll Group, provider of transport and logistics, has officially opened Toll City – a S$228 million, next-generation logistics hub, spanning over one million square feet. 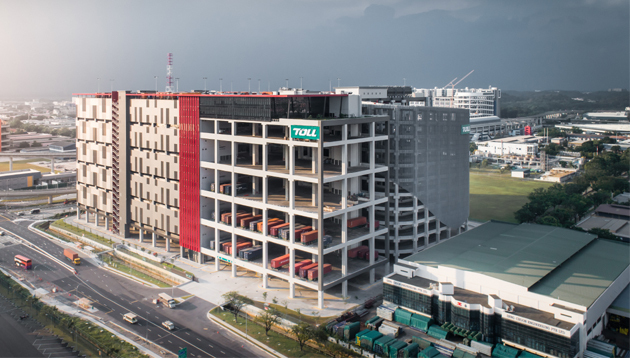 Strategically located in Tuas, Singapore, the opening of Toll City is expected to increase Toll’s Asian network and traffic, while its proximity to road links into Malaysia and the growing Jurong region in the West of Singapore will make the facility an excellent land-sea interface for customers. Toll City, supported by the Singapore Economic Development Board, is well poised to complement existing operations in the Asia-Pacific region and serves as a gateway that will connect regional and global customers. It will fuel growth across local and regional markets in the retail, FMCG and healthcare sectors. Creating careers in logistics, Toll is focused on supporting the development of local Singapore talent through various internal and partnership programmes. Toll’s graduate programme (now in its second year), is designed to attract and develop future logistics leaders, with global rotational assignments across the company’s three operating divisions. Toll also inducts young talent via the via the SkillsFuture Earn and Learn programme for logistics and the Singapore-Industry Scholarship programmes. Toll also supports local, experienced talent from other industries forge new careers in logistics, through the Professional Conversion Programme and Attach and Train programme. In addition, Toll is piloting new technologies to augment manual labor to improve safety and efficiency. Other emerging technologies being explored at the facility include automated machine handling equipment, in-warehouse cycle counting drones, voice picking and intelligent conveyor systems, augmented reality glasses for navigation and instruction, and exoskeletons for warehouse operation. With Toll City, it has attained a combined scale allowing the company to leverage on all new and existing investments in Singapore to create new local jobs. To date, it has added a 250 headcount and expect to increase more by 2020 as it works towards achieving full capacity for the remaining investments in Singapore. “Our dream is that we are able to use our logistics assets and systems much more efficiently. I have a dream whereby all the things in the warehouse are organised overnight in the dark – picked, packed and delivered in the night to all the destinations, without holding up the traffic or fighting with the daytime logistics flow. That is how smart urban cities should look like. This is the dream that we have and this is why EDB will lead the effort to work with all logistics players to realise this dream,” he added. “With the SiTadeL Control Tower in Toll City, we have been addressing Singapore’s urban logistics challenges with real-time visibility and monitoring of our moving assets. As a result, we offer an integrated supply chain management process that’s prepared for surge periods, and potential supply chain disruptions caused by human or natural disasters,” Phang said.